COLUMBIA -- Brendan McManamon is still part of the team. It's just that in a way, he's more on his own than ever before. McManamon is a junior at the South Carolina Governor's School for Science and Mathematics, a boarding school in Hartsville with an enrollment of 288 juniors and seniors. "The schedule's a lot different from normal 8 to 3," McManamon said, "but it's working." Yeah, it seems to be working just fine, thanks. Academically? McManamon, who attended Powdersville High School his first two years, maintains a 5.28 grade-point average. "I still have straight A's, so that's good," he said. "I'm proud of my 100 in AP Calculus." Athletically? McManamon, who led Powdersville to the Class AAA cross country state championship as a sophomore, led his new team to the first athletic state title in the 29-year history of the school Saturday at Sandhills Research Center. Governor's School won the Class A title with 42 points, edging defending champion Dixie, which finished with 46. McManamon cruised to the individual championship with a time of 16 minutes, 13 seconds. Zane Jackson of Palmetto Scholars was runner-up in 17:24. McManamon, who took third in AAA last year, applied to the Governor's School mainly for computer science and to take more classes. "It's a really tough school, but athletics definitely helps with balancing everything, and it's something else to do," he said. Needless to say, it's been good preparation for college life. "It's been awesome living in a dorm and getting to know everybody better," McManamon said. "It makes the team a lot closer. "(Running) takes your mind off school, and we practice 4:30-5:30. We have to practice later because everybody has labs and different schedules, so that's a little different. And, of course, academics is always No. 1." McManamon said the students are unable to leave school early for meets during the week. "We can't really do Saturday invitationals because of the school schedule, so it makes it a little harder, but our guys and girls have done well," he said. "We have time trials every week if we don't race, just trying to still get competition in and hard effort. "It's up to us to really want it, because it's pretty easy to just focus on school and not be too involved with sports. You really have to make an effort to put that at the top of your priorities when you have so much schoolwork and other things vying for your attention." McManamon and his team competed at Sandhills Research Center three weeks before the state meet in the Sandhills Invitational. 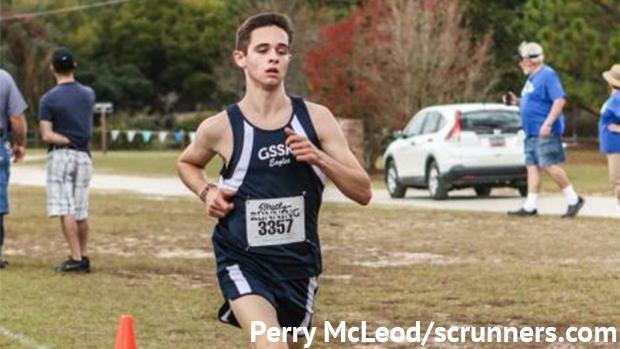 McManamon took eighth in a stacked field; Class AAAA state champion Sam Gilman won the race; AAAAA runner-up Patrick Spychalski of Wando was second; AA champion Colin Baker of Academic Magnet was third; AAA champion Sam Boykin of Bishop England was seventh. McManamon ran a PR of 16:02. Three days later, in the Region 2-A meet, McManamon won with a PR of 15:58. In the state meet, McManamon was unable to achieve a PR, but he was able to win handily (A boys video highlights). "That's how most of the races have been this season," he said. "I've gotten to a few larger ones, but it's again up to you. It's just trying to push as hard as you can, even when nobody's right next to you. "I tried to go hard the first mile and get after it. I paid the price for it a little bit on the second mile, but I'm glad I came away." He also had a nice reunion that day. McManamon hadn't been back to Powdersville to see his family in about a month, so they were able to get together to celebrate his successes. As for McManamon and his teammates, they got together with a new acquaintance during the awards presentation -- the state championship trophy.